I'ad always go for Hesalite. The hesalite gives it a more vintage vibe. It's hard to explain how it's 'warmer'. It's sort of like listening to a vinyl record vs digital recording. Hesalite. It looks nicer, gives the dial a warm vintage look, is historically correct if that bothers you. Also if you actually break the hesalite its £50 to replace. Sapphire although less likely will cost £500 to replace. Both great. When you try them on you will know. Good luck, keep us posted and enjoy the process. 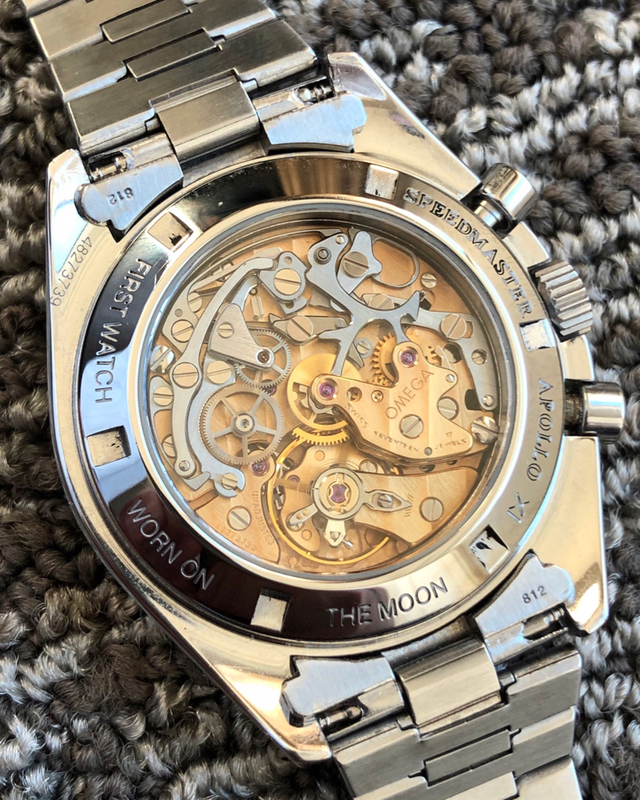 The sapphire version doesn't have the iron anti-magnetic plate on the back of the movement. This was a consideration for me. I bought hesalite, but get whatever you want. whoischich and requiemjp like this. Most likely, I'll show up at the dealer, try both on, look at both with critical eyes, and make a decision on the spot. Help me out here folks! Nice list and looks like you’ve done quite a bit of research! I would add that the hesalite gives the watch more of a vintage vibe and feel since acrylic crystals were quite common then. I agree with helderberg that if you are buying for the moon landing connection hesalite would be best but if not the durability of the sapphire might be preferred. Regarding the warmth topic - it might be the way the light passes through the hesalite vs sapphire but the sapphire has a colder more bluish tint where the hesalite has a warmer more yellow tint. The difference is subtle and might be just in my head lol. I chose the hesalite since I got the watch specifically to remind me of the all that went into the moon landing. For me, it had to be sapphire. I'm more likely to put (annoying) fine hair line scratches on my watch, than be hitting it with enough force to shatter the glass. I've had many, many watches over the years that I've managed to scratch the face, but never had one shatter on me. It's really a personal choice, as there are lots of positives & negatives for both. So, I'm getting close to purchasing a Speedmaster Pro, really close! But I still can't decide between the 2 versions. I'll be purchasing new to get the full Omega warranty and have found the watch at a nice discount. Now, I know all the arguments, pluses, minuses for both and I'm still at a loss. Tell me something I haven't heard in the "Hesalite vs Sapphire" debate please. For those of you who have owned both versions, I'd especially like to hear from you. Anything to help make the decision easier will be greatly appreciated. Go with the sapphire version, particularly if you plan to wear your speedmaster every day. It is a much more robust crystal. Don't fall for the argument that the hesalite version is the "true" moon watch. The true moon watches had different movements. 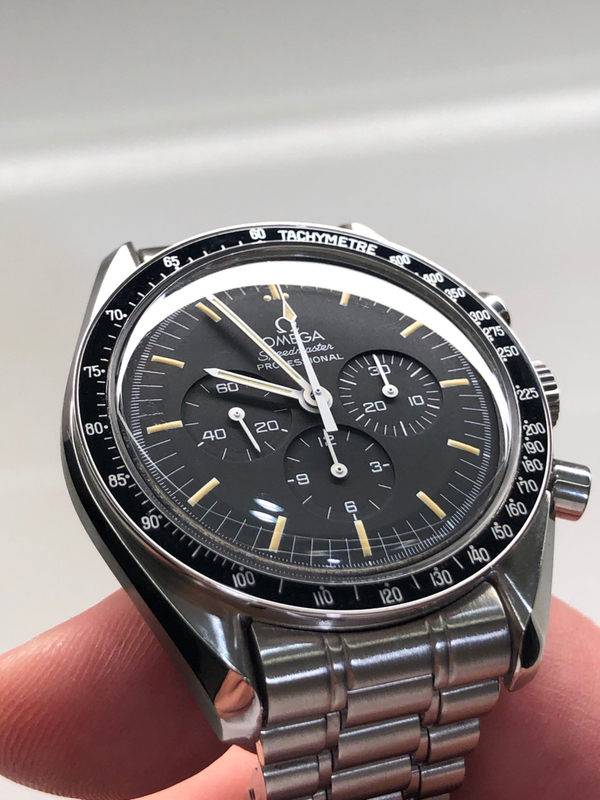 Today's Speedmaster is the descendant of the moon watch, and like most descendants it looks quite a bit like its predecessor, but that's about it. I hear Omega is bringing back the calibre 321 movement for an LE Speedmaster commemorating the 50th anniversary of the moon landing. Even that won't be the true moon watch, but it will be close. It will also set you back a pretty penny. Years ago I wrestled with the same questions you are asking. I purchased a sapphire version and I couldn't be happier. Not having to deal with a tube of polywatch in 2019 is the way to go.